Media coverage on sinkholes in Florida may seem to be increasing in recent years. However, the more likely explanation for what appears to be a growing problem with Florida’s terrain is simply that the state’s increasing population translates to more encounters with existing previously undiscovered sinkholes. As South Florida becomes more densely populated, more people are relocating to Central Florida in an area that is known as Sinkhole Alley. There are three counties surrounding Tampa in Florida’s central swath that compose Sinkhole Alley: Hernando, Hillsborough, and Pasco counties. The state’s sinkhole problem is largely due to the soluble limestone base that lies beneath the ground’s surface. The limestone is dissolved by naturally acidic groundwater and rainwater, which forms underground caverns and springs. Farming activities increase the problem when pipes are built beneath the area’s roadways without properly back filling or when farmers pump warm water underground to help crops avoid freezing. 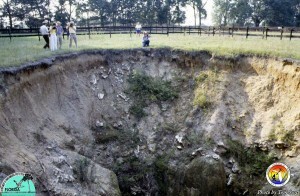 Due to farming activity, sinkholes occur more in January and February, when the weather is colder, and in May and June, when the climate is drier. Sinkholes have a great potential to pose problems for property owners as an underlying sinkhole may damage a home or building’s foundation or even cause total destruction in the event that the underlying soil collapses. Signs of a sinkhole issue include doors and windows that do not close properly and cracks in pavement, floors, ground surfaces, or walls. Property owners who notice that previously unexposed area of their building’s foundation are now exposed should consult a foundation repair specialist. Exposed tree roots, spongy or soft areas in the lawn, or depressions in the ground may also be a sign of a sinkhole. Activity that might suggest the presence of a sinkhole should be immediately examined by professionals, such as the ones at Foundation Services of Central Florida. Property owners should first consult their insurance company prior to contacting a landscape or geologist, who will be able to assess the potential sinkhole and provide the appropriate services to correct the issue. Although sinkholes are most common in Sinkhole Alley, cavernous limestone may be found all over Florida, which means sinkholes may occur in many other parts of the state.